So……. Dave Smith approached us in August – a complete triathlon novice – looking for some coaching with a view to training up to do an ironman. ‘Cool’ said Fran – ‘what sort of time scale are we looking at?’. ‘Well I’ve entered IM New Zealand in March’ came Dave’s response! The ace up Dave’s sleeve was that he was already an experienced marathon runner. The opposite of the ace (what is that?) was that he could just about swim a length in the pool and had, in his words, ‘the upper body strength of a 10 year old boy’. 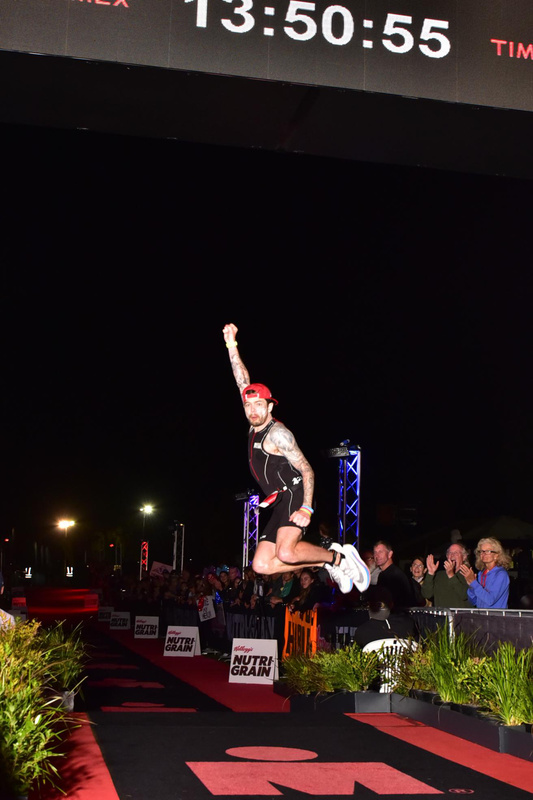 Dave, however, is the master of consistency – such a key attribute for an endurance athlete – and coupled this with great adaptability so that by the time March came around he was regularly knocking out 4k swim sets averaging 1.40 for 100m. Lots of turbo work on the bike due to predominantly winter training meant he was strong but short on miles as he went into the race. I’ll leave the rest of the story to Dave in his own words…….. Going into the race I couldn’t decide if I was excited or nervous, confident or unsure, ready or unprepared. The race began with a deep-water mass start initiated by the firing of a canon as 1,100 athletes swam for their lives. I had positioned myself somewhere in the middle; with my new found swimming technique I was quietly confident that I would have a good swim and maybe even draft a faster athlete. I quickly began to regret this positioning as I got kicked, swam over and hit with flailing arms as I thought ‘oh no, what have I let myself in for’. With my heart rate through-the-roof I decided that it would be best to swim out as hard as I could. After a few minutes I found space and was able to relax, settled into a rhythm I now just needed to swim in the right direction. On a couple of occasions I found myself coming together with another athlete as we literately crossed paths, I like to think it’s because their line was wrong but more than likely it was because I was veering off course. I progressed well, feeling good and stopping only once to defog my goggles. Coming out of the water I skipped past half-a-dozen or so athletes on the 300 metre run into transition. I stomped off my wetsuit and prepped for the bike in good time. On the bike the first three miles or so were uphill and my five mile split was, slow. I felt under pressure to speed up but knowing that I’d neglected long rides in training and prone to under-fueling I was careful not to go too hard, too soon. I’d loaded my bento box with a few different flapjacks broken into bitesize pieces and ate one every 15 minutes, this was perfect and definitely something I got right. Coming through Taupo at the end of my first lap the crowds were out in force, I felt good and comfortable (as much as someone can be when they’re trying to hold an aero position for three hours) and decided I’d push it a little harder for the second lap. I sped through special needs, up the hill and straight into a headwind, my plans of a negative bike split soon disappeared as I lost about 4 mph from my average speed. Mentally in a dark place, the only thing I thought I could do was to keep on the aero bars, shout expletives and regret my life choices. The wind died down, I hit the turn, felt good again. I advanced well to the climb responsible for most of the course elevation, at the 90 mile mark it’s nicknamed ‘Heartbreak Hill’, I decided to stay in the saddle, spin away and be patient. Coming off bike into transition was fine, thankful that I hadn’t punctured I handed over my bike to a volunteer who kindly racked it for me while I raced into the change tent to put on my running shoes. Out of transition I quickly settled into stride without any trouble, I ran well keeping pace for a couple of miles before getting to the first hill, now I had checked the bike elevation but not the run believing it to be flat – it wasn’t flat. I felt good to run the hill but to be safe I decided to walk it, this was another good decision, from then that became my strategy, run the flats and downs and walk any significant hills. After about an hour my Garmin died, I realised then how much I relied on it as I had no idea of pace or time. Not knowing when to fuel, I continued from aid station to aid station picking up pretzels and electrolytes whenever I could. About eight miles in, I felt a pop in the top of my calves and my legs gave way, I was unable to run but still maintained a shuffle to the medical tent. I got my calves stretched out and continued for another lap, throughout the run I could feel my calves worsening so I continued to get them stretched every six miles or so. Now those that have seen me finish know that I do so strong, the rush of adrenaline with a dash of a relief is an incredible feeling, rounding the corner onto the red carpet I was filled with emotion. I powered to the line, let out a shout and hit my distinctive jump finish. Flooded with confidence I had a medal placed around my neck, a towel wrapped around my shoulders and I was escorted to the finisher tent to be weighed (I had lost 3 Kg!). After a couple of minutes and not really knowing what to do with myself, I found a seat and gathered my thoughts. It was then that I realised that I had actually done it, I had become an Ironman.